Event Budget Template – There are several kinds of events ranging from the local civic clubs annual banquet, the major company’s board of directors meeting, wedding receptions and pre-wedding functions. Regardless of the purpose of the event or the size, two things have to be considered. The first is how the event is going to be stage. It could be at a home, a banquet hall, an auditorium or many other places. The second factor is the cost. More precisely, does the amount budgeted for the event meet or exceed the anticipated expenses, or do the costs outpace the available dollars. There are ways to avoid such pitfalls. 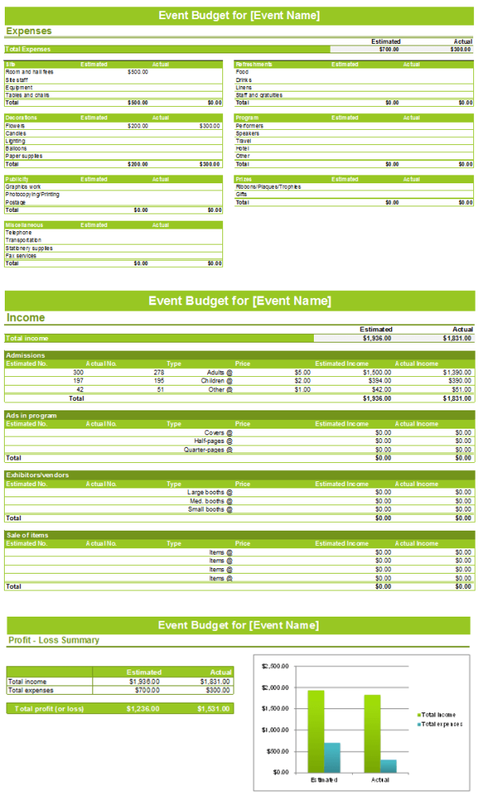 This Event Budget template is created in Microsoft® Excel and is available for free. One, The Event Budget for (Event Name) brakes down the event into numerous parts and gives the planner the opportunity to get estimated prices for various services. Those estimates can then be compared to the actual expenses as they are incurred. With the line-item template, it is easier to see where estimates were not in line with actual costs, allow adjustments to be made elsewhere in the budget.